Large and cozy apartment located in central Copenhagen. The apartment is perfect for 2 adults and 2-3 children. There is an adult bedroom + 2 children bedrooms. The apartment is close to Nyhavn, Kongens Nytorv and Kongens Have. Easy access to Metro Station. Lovely neighborhood halfway between the Royal Gardens and Kongens Nytorv. Gothersgade stretches all the way from Kongens Nytorv to the Copenhagen Lakes. All of Copenhagen is at your feet from this location. In this area there are many small, but excellent restaurants that many tourists still have not discovered. A great location to experience the real Copenhagen. Exciting opportunity in the middle of Copenhagen. The apartment is for 2 adults and 2 children. Hall, combined living / dining room at each end of the room is a kids room. KIDS BEDS ARE AROUND MEZZANINES they have to use the lader to go to the bed. Large kitchen with dining space for 4 people. Lovely large bedroom. Separate bathroom with shower and separate toilet. WIFI, TV with DVD, Local Danish TV stations, stereo, washing machine and dishwasher. The apartment is located on the second floor of the property without an elevator. Double bed = 180 x 210 cm. Single bed: 105 x 180 cm. 2 x Single bed = 2x 70 x 160 cm. - the windows have the beauty of the old ages. This means as well that they are single glazed and thus poorly isolated against noise and heat (summer 2018). - the house is located next to a busy street. Thus, because of the simply glazed windows the living room was a very noisy place. 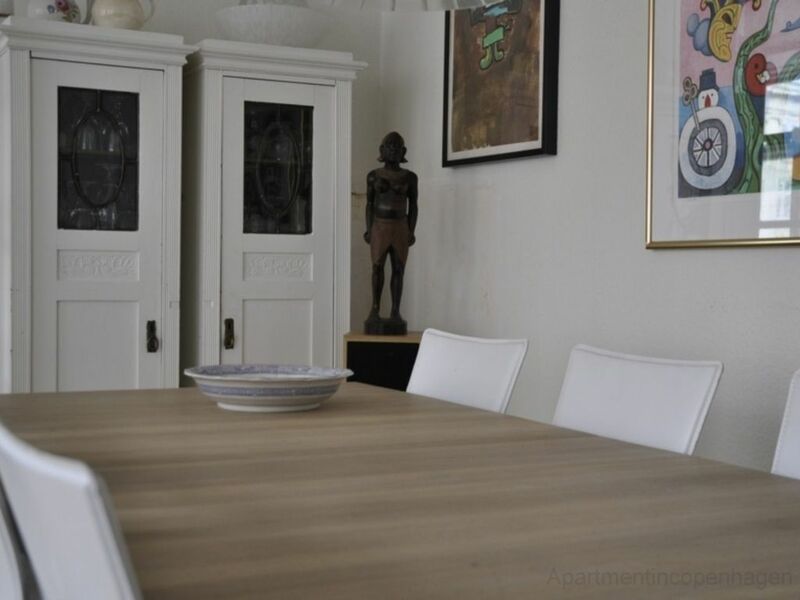 In the night it was ok.
Charming, bright flat in the beautiful heart of Kopenhagen. We loved the atmosphere of the old house and the historic district near the historic harbor and the Kongens Have. This apartment was in the perfect spot for us. In addition, it was extremely comfortable. The only downside was the shower drain which didn't work well, but was not a major problem. We would come back again to this apartment. Charming apartment. Convenient but loud. Overall, we enjoyed our stay. The apartment is roomy and convenient to tourist attractions and public transportation. However, the charming street gets really loud every night for several hours. Most of the noise is drunks whooping and singing and motorcycles gunning their engines. We were thankful that we brought earplugs. I would absolutely stay here again, but if you are looking for a quiet nights sleep, this is not the place for you. The apartment was conveniently located to many tourist sites and mass transit. It was well appointed and had plenty of space. The staff at AIC was great with check in and answering questions as we prepared for our trip. One downside is that the apartment is located on a street with several bars nearby. For us, this meant extremely loud bar patrons shouting and singing and gunning their motorcycle engines nightly from about midnight until 4 in the morning. If you want a quiet night's sleep, you may want to look for a different apartment.